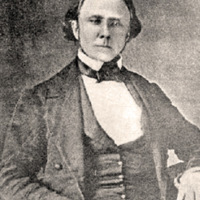 Photograph of William H. Thomas, founder of the infamous confederate regiment known as Thomas' Legion. At the time of this photograph, taken in 1858, Thomas was 53 and had become, perhaps next to Zeb Vance, the most influential man in western North Carolina. Photo of William H. Thomas, Civil War Era NC, accessed April 24, 2019, https://cwnc.omeka.chass.ncsu.edu/items/show/314.